closest, with his buddy Hagrid. 8 months after being cria shorn. CHAMPION 2016 AOA National Spin-off. Highest Scoring brown. Beau Topher came to our farm as a small male who needed a little TLC. He is shy and mellow, which being from a large farm, led to him being on the small side. We put him in a small group and Voila! He has been maturing nicely and is starting to take a leading role in our program. He has the pedigree to stand behind his growing status on our farm. 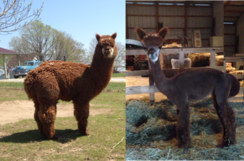 in 2016 he took second in a TOUGH class at the Rail Splitter Alpaca show behind the color champion. We envision Topher taking the banner next year! Topher’s maternal grand-dam RK Makayla brought home Reserve Champion Grey at Southern Select, 2010. She is housed at Scenic Sky alpacas with an asking price of $15,000. Adding DESTINY’S PERUVIAN CASTILLE, also a grey color champion with multiple first place ribbons to the mix produced Topher’s dam, a gorgeous Rose grey girl with incredible density. On the paternal side Topher continues to bring in the awards, a grand-dam with championship banners form Michigan Alpacafest and Michigan Alpaca Breeders Show and Fiber Fair, 2008. Three shows in her lifetime, three first place ribbons and two championship banners. Match miss Roulette with Majestic Peruvian Jeremiah, also a multiple first place and banner winner, 4x herdsire of the year, not to mention a son of MFI Peruvian Jericho and you produce Topher’s outstanding sire, Crystal Kalin. Crystal Kalin went on to win Reserve Champion at the 2011 Futurity and collect an impressive number of first place and championship banners. With genetics like these, impressive on both maternal and paternal sides, it is no wonder that Topher is getting all sorts of special treatment at our farm.